The underwater photographs appearing throughout the Seagate World blog were taken by me. 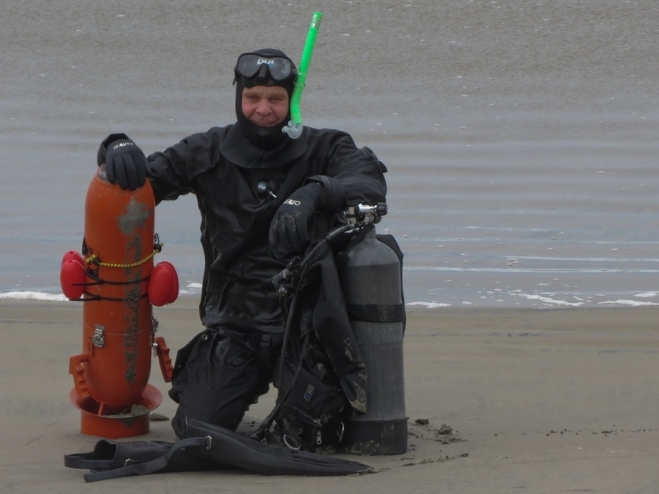 I have been diving for over 40 years. I am now 60 years old, and have a healthy case of denial. While diving at this the age is today’s topic, the real message is that it is possible to continue to do very demanding physical activities in our “senior” years …. if you take reasonable care of yourself. 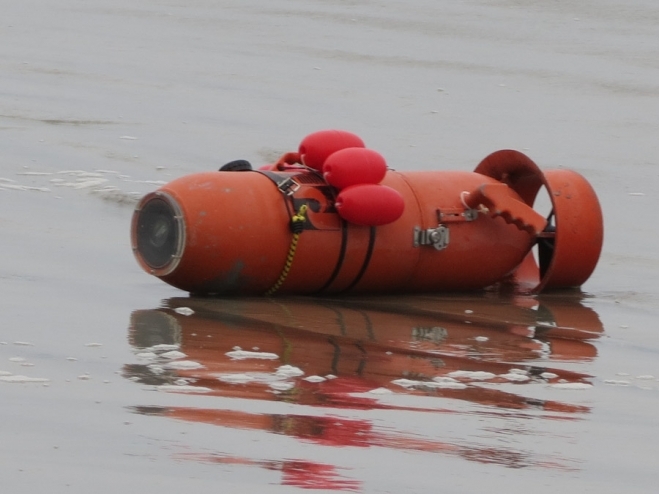 The orange cylinder in the photo above and below is an underwater “scooter”, which is basically an aluminum torpedo with an internal (rechargeable) battery pack that propels a diver through the water. This model is capable of reaching 400+ ft. depths, and travel for almost 2 hours when fully charged. 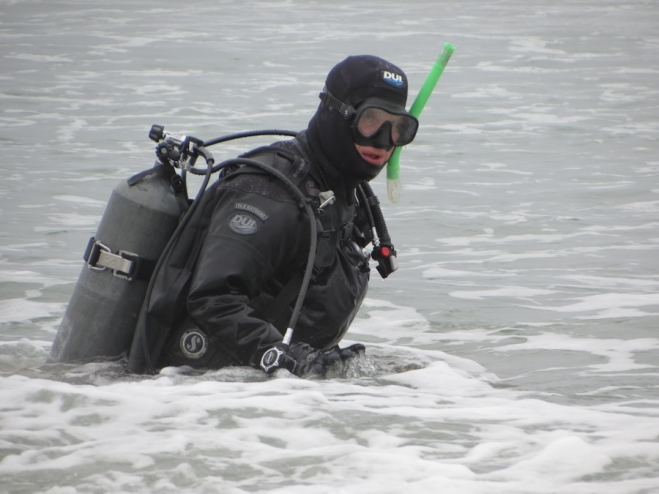 The other gear in the picture includes an air tank, fins and a new “dry suit”, which allows a slightly more comfort than a wetsuit when diving colder waters. At this stage in my career, I no longer dive below 120 feet. There are old divers and there are foolish divers … but there are no old foolish divers. Diving can be almost effortless when you are fortunate to be able to experience warm tropical water and … dive of the back of a boat. Once you enter the water, you are essentially weightless and the visibility is usually unlimited. However, in the colder temperate waters along the Pacific coast between San Diego and Ensenada (Seagate’s World), the waves are big, visibility is poor, the currents are strong, and diving can very very strenuous. The amount of gear being carried on my back along with the scooter adds up to over 140 lbs in extra equipment and weights needed to safely dive and navigate these colder waters. Sometimes a beach dive is all that is available. Going off the beach provides the additional strain of getting all of the gear on and carrying it to the water’s edge. In addition, there are the initial 5 minutes of swimming through the breaker zone. On this particular day last week, the water visibility was less than 2 feet. It was difficult at times to even see the compass that is mounted on the back of the scooter as an aid in navigation. However, each day is a different adventure and a new challenge. It is always worth the extra effort just for the hour or two of peace to be alone (as a rule not recommended) in this water world. In the world of diving, if you are over 40, you are classified a senior. My certification card issued in 1972 by the YMCA is usually older than the oldest diver I encounter on most dive trips aboard boats. However, age is not a reason to retire from this activity, nor is age a reason to give up on the things you enjoy in life. The extra work, careful diet, and daily routine that allow me to extend my diving career are also things that are very healthy and are helping determine how I will do during the next 20 years of my life. We really do have some control over the quality of our “senior years”, whether we stay in good shape and can remain active and healthy or give up and retire into the recliner, working our way through a six-pack where the most serious exercise we might face is using a channel-changer. Diving at any age is a very physically-demanding activity. According to the “DAN – Divers Alert Network”, the primary accident insurer for divers, the major cause of diving fatalities in North America is due to heart attacks. Common factors associated with diving fatalities included running out of gas, entrapment or entanglement, buoyancy control, equipment misuse, rough water and emergency ascent. Asphyxia by drowning, air embolism and cardiac events were the principal injuries or causes of death. About one-quarter of the diver fatalities in North America were associated with cardiac events, mostly in older divers. Exercise– At times, my wife will call me an “O-C” as in obsessive-compulsive. I (try to) swim 5X each week ½ to 1 mile each day, and go to the gym at least once a week on an off-day. The 7th day is my day of rest or sometimes diving. This regimen has become physically harder to accomplish with each passing year. However, I also have much more free time now since our kids have grown up and moved out. The average American watches 5 hours of television each day. I try to take one of those hours each day and dedicate it to doing this sort of physical activity. The other 4 hours are for reading and relaxing with my wife. Discretionary time is a wonderful thing to have if it is used wisely. Food– While food can be one of the greatest pleasures in life, I try not to let food rule my life. Most things that taste good, are not got for you. Things without much flavor are usually better for you to eat. Someone up there is having a good laugh at our expense. I reduce the carbs wherever possible. Carbs taste good. But carbs cause most of our circulatory problems, weight gain, and contribute to a weakened immune system and to the most common diseases in old age (cancer, diabetes, arthritis, heart disease … etc. etc.). I eat a lot of vegetables, fruits (green apples, berries, and other low-sugar fruits), and protein (chicken, fish, an some red meat). I used to love cookies, cakes, ice cream, chocolate bars, and See’s candy (we are in California). However, I would rather be free of arthritis, back pain, heart problems, and all or at least most of the other ailments of old age and possibly extend my dive career another 20 years. Supplements – The truth is that all of the supplements that we have developed and produce at Seagate are really items that I determined would be important for me or my family to be taking on a regular basis. I take all of the supplements we produce. There is not one in particular that I could recommend by itself. They are all important for their own reasons. For example. I take the capsules of broccoli, garlic, tomatoes, and artichokes (available to you later this summer) because those are veggies I do not usually eat. Our latest big project, the production of a pure extra virgin olive oil in glass bottles (available in 2013) I am currently using as a replacement for butter. Dealing with stress– I try and keep things in their proper perspective. I try to be positive. When all else fails, I look at a fish picture and smile. Sally Bartle - My son is 22 and just received his diving certification. Due to the fact that we take many of your supplements and eat mostly healthy food and exercise, I’m sure he will be diving until he is a very old man! BTW, you are 60 years young!